I absolutely LOVE the attention to detail. Look how the cable V’s in the bottom of the neck opening, and how the side gussets decorate the side seams. Just gorgeous. Amber is thinking about a knit along. I think it’s a must! Now, to decide on the yarn and color. I have no idea right now. It takes 1824 so there are alot of choices. Any suggestions? That’s a great hoodie. I see the pattern recommends a wool yarn with some inherent elasticity, and says that a yarn with less stretch (such as 70/30 wool silk) will be drapier with less pronounced cables. This Tahki New Tweed is worsted weight, 70 wool, 15 silk, 11 cotton and 4 viscose, without much stretch. 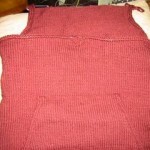 The gauge is 4 st = 1″ on size 8 needles. It has a soft rather than a crisp finish. I would wear this yarn outside down into the 50s, but I honestly don’t think it’s quite right for this pattern. *sigh* i agree with ya. i still might have to pick up some at knitpicks anyway as it’s such a great price. They even have the other colors on sale (although a bit more money than the natural). mission falls 1824 cotton would be lighter weight but it has the same issue – no stretch.